But we talked about gratitude in church today, and I thought, if I just let this go without acknowledging it, I'm being ungrateful. Which I don't mean to be. 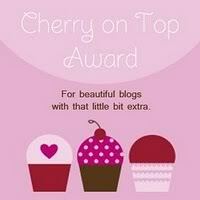 Because I am super, super grateful to get a blog award. And this one came when I was feeling emotionally fragile and needed a little validation. One of my new fave birth mama blogs is called Carrying a Cat By the Tail, and the blogger, who goes by A Life Being Lived, thought I needed a little pink to balance out Captain Cluck and the Daisy on my sidebar. Wasn't that nice of her? I mean, like I said, I don't want to brag or anything, but I don't want to be ungrateful, either. And I love cupcakes. Of course, now I'm supposed to spread the love to 5 other people. Sigh. I hate choosing favorites. Some asked me once on Formspring what my favorite adoption blogs were, and I answered, against my better judgment. I do love the blogs I mentioned, but all I can think of are the countless others I love that I should have mentioned as well. So for now, I'm going to be a weaselling weasel, and weasel out of further nominations. I wish I could give it to all of you the way I did with Captain Cluck, because y'all are awesome. Would the blogosphere explode if I broke the sacred rules of the Blog Award? Like, if I said, "Hey, readers, you are award-worthy, please take this award for yourselves - all of you!" would that be a bad thing? I mean, if anyone can just take one it probably defeats the purpose of them being awarded. Which is probably why I haven't seen Captain Cluck floating around too much - people like the idea of being chosen for something. Well, too bad. For now, I choose to abstain from further awarding. Thanks, ALBL! You and your lovely blog are awesome. As a token of my appreciation, please take a chicken. Formspring Revisited: What the H?